N-XTC is all about happiness, we like you to have a smile on your face every time you walk towards your car. To deliver happiness to “the driver” we coach, train and update installers in end to apply these great products the best and give you the maximum performance with every layer of coating being applied. 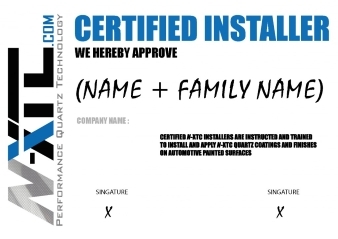 Since we are the “new player” in this market – segment we have positions open for installers. Ideally we like to get in touch with detailers who write CRAFTMANSHIP with capitals. Detailers who are well experienced when it comes to multiple paint – correction and paint – protection. Detailers who see people as the people they are, like to ask them questions and listen good. Detailers who, based on the listening, offer correct services that fit the end – customer (driver) in quality, useability and in budget. © 2016 - 2019 N-XTC.com. All Rights Reserved.